Designed to provide an aesthetically pleasing permeable surface that is pedestrian friendly and functional for vehicular traffic, Aqualine Series by Belgard® combines interlocking spacer bars, a smooth surface with a micro-chamfer, and joint openings designed to optimize infiltration and maintenance. All units are part of either a 3-inch or 4-inch dimensional increments to allow for true installed dimensions. Permeable Interlocking concrete pavement systems such as Aqualine consist of concrete pavers with joint openings filled with permeable aggregate that allows stormwater to flow into layers of crushed stone that support the pavement while providing water storage and runoff control. As the rainwater sinks through the four feet of aggregate under the pavement, the rocks act as a filtration system to clean oils and chemicals from the street above. Geomembrane dams and the aggregate detain the water and slowly release it into the existing stormwater sewer system. Since the water does not run directly to the curb gutter, flooding is significantly deterred during heavy rain. 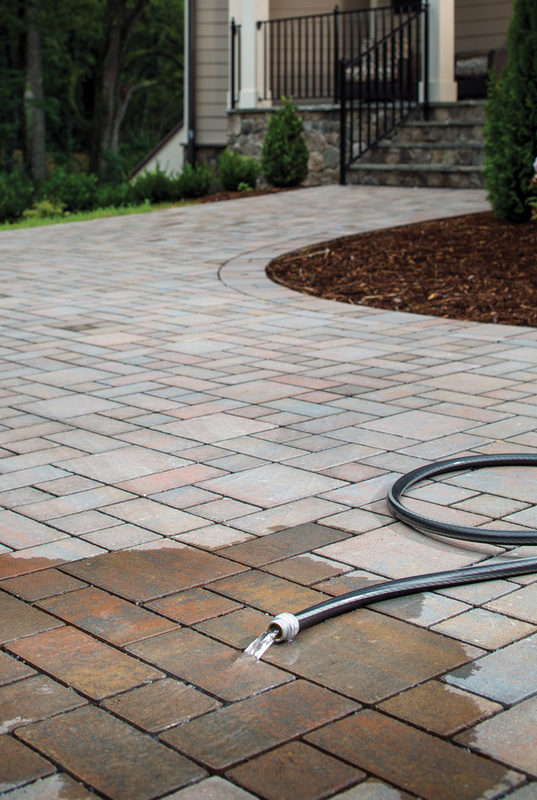 To learn more about Aqualine permeable pavers, including specifications and features, visit the Belgard website.